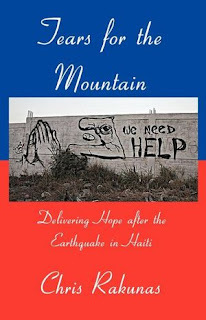 Tears for the Mountain is a non-fiction about a medical mission trip to Haiti following the 2010 earthquake. A portion of the proceeds benefit the orphanage where the story is based. The audience is meant to be the general adult public. The reason that the book is interesting is that it chronicles one of the medical mission trips to the island. 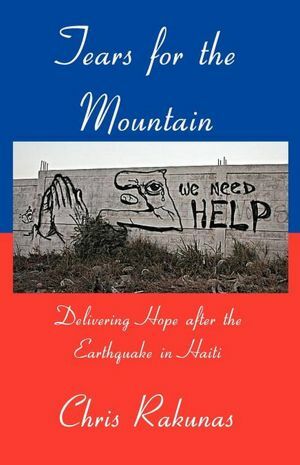 I wrote the book to show what mission work is really like, and I tried to not glamorize it or do anything other than give the reader a feeling for what it was like to be there on the ground. Not all of the stories in it are heart-breaking. There is hope and humor in it as well. The title comes from two things. First is something that Miriam Frederick, the Mother Teresa of Haiti, said to me. We were flying to Pestel, which is a remote village on the end of the southern tip of the island, and it is a very mountainous region. I mean the mountains just shoot up from the ocean, forming some of the most beautiful landscape I’ve ever seen. As we were landing, she said to me that the word Haiti means mountain. Later, we were driving through Port-au-Prince and I saw a piece of graffiti on a wall. It was a map of Haiti with an eye in the center and a tear coming out. I took a photograph of it, and that photo ended up being the cover art for the book. Ken Tupper, the publisher at Divertir, really did all the design work for the cover. The photograph is the one I mentioned above, and it really describes the feeling of everyone in the entire country at the time. It was very difficult, not only for those who had lost family members or been injured, but for anyone just to see an entire nation in ruins. The colors are the colors of the Haitian flag. We wanted to have a clean and simple design that let people know that the book was about Haiti and what had just happened there. It’s a toss-up for me between Miriam Frederick and Dr. Stephen Schroering. Miriam really is the Mother Teresa of Haiti, and just to be in her presence is to be near someone special. She has been in Haiti since Reagan was president, and I have no idea how many children she has saved. When she walks through the refugee camps and slums, she touches and hugs every child and mother that she sees. It’s just amazing to see her in action. Dr. Schroering is an orthopedic surgeon who volunteers his time down there. Many US doctors rely on complex lab and radiology tests to treat their patients, but Dr. Schroering makes the best with what he has there. I never once heard him complain that he didn’t have his regular tools. The only thing he complained about was not being able to do more to help. He’s a breath of fresh air in the medical community. Ooooh, that’s a tough one. There were many people I met in Haiti who were there to ‘assess the situation.’ That’s what they said they were doing when I asked them. They weren’t doing anything but watching. I had a specific task to accomplish, which was delivering supplies to hospitals, and I thought it was really disgusting that someone would come to a disaster site, see all the pain and suffering, and not do anything but look. It was as though they were on a suffering safari. I would have included pictures in the book. When I tell people that Port-au-Prince was reduced to rubble, I think that they think I’m exaggerating. But every time I show people the pictures, they are taken aback. It’s really hard to put both the natural beauty of Haiti and the extent of the damage into words. When the book was first released, it was the #1 selling Social Policy book on Amazon.com. I was really proud of that fact. Paul Farmer, the UN Special Envoy to Haiti wrote a book about his experience on the ground, and it’s really good. (It’s hard to beat his work) The difference between the two is that he is a Harvard professor, a high-up UN member, and a physician. I’m just a regular Joe who got caught up in the event, so our perspectives are quite different. When I’m not writing, I like to play guitar, scuba dive, and cook. But probably my strangest talent is my ability to laugh and have a good time through anything. I’ve been kidnapped in Eastern Europe; accidentally taken a flight to Seoul, Korea; and dodged the police in rural Mongolia. I always seem to have a blast, no matter how strange things turn out. The best way is to go to www.facebook.com/ChrisRakunas. I post regularly there, but only when I have important events to report. I have another book with Divertir Publishing coming out this summer. It’s fiction, and it’s called The 8th Doll. The book is a fast paced action adventure story that ties together the Mayan apocalyptic prophecy, facts about the architecture and culture of the Mayans, and a murder mystery. It is the first of a 4 book series, and I have just finished the follow up, The Eye of Siam (although I don’t have a release date for that yet). Please tell all of your friends about Tears for the Mountain. I find that posting on Facebook and other social media sites really helps. I am always appreciative of reviews on Goodreads or Amazon as well. If you have a hard time explaining why the book is so powerful, you can also share the promotional video with friends and let the pictures do the talking for you. Write. That’s it. More people spend time talking about writing or thinking about writing than anything else. Just be disciplined and dedicate time to your writing. Let me put it to you this way: when you’re sitting on your deathbed, do you want to say, “Man, I’m really glad I watched all those American Idol episodes!” or “Man, I’m really glad I got to tell the story I wanted the whole world to read!”? Here are the passages that cover us going from the airport to the orphanage on the first night. This really captures the way the entire trip was: two emotions that seem totally wrong hitting you back-to-back. As the jeep pulled away from the airport, Miriam told me to sit in the front with her. It was hot enough that I had to roll down the window, which just added to my paranoia. Were we going to drive through the city safely? Would we be attacked, four people in the city in a nice jeep? My hand was on my knife, and my heart was jumping through my chest. Instead of finding people, though, I found that Port-au-Prince was deserted that night. We drove down the main thoroughfare without seeing anyone else. There were no vehicles. There were no pedestrians. There was just the smell of smoke in the air and complete blackness around us, since there were no street lights to light our path. The walls of the compounds we passed whizzed by, occasionally giving me a glimpse of what was inside. One of them had an eerie, flickering yellow glow, two soldiers with machine guns and a Humvee inside. Another had some sort of factory. A third housed unfinished construction. But, for the most part, there was nothing to see on the way to the orphanage. After a few roundabouts, we turned onto another main road. Theodore told me that this road went all the way from the capital out to the outskirts and was meant to be the start of a highway that would reach the end of the island, but it just was never finished. Along the sides were shops with colorful paint jobs. The words in Creole were unknown to me, but some of the pictures made it obvious. Still, there were no people on the road, just the smell of smoke. It reminded me of India, a third world country that just dealt with its own problems in a way that was different from how we did. Instead of letting trash pile up, there were some burning trash heaps on the side of the road. Instead of flowing water and sewers there were mystery puddles in the gutters. I felt better knowing that there were no people to face. It sounds terrible, but at that moment I was not looking to help someone else; I was just looking to get where I needed to be safely. The fear of the unknown was gripping me hard. Miriam started to pull the jeep over, and I noticed a small road hidden between two shops. In our way was a pile of tires, two levels high, with giant rocks in the middle of each tire. A face appeared from the shadows and approached our jeep. Theodore stuck his head out the rear window and spoke with the man. After a moment or two, the man removed some of the tires and rocks and let us in. As the jeep started down the bumpy dirt and rock road, I looked to the sides. There were makeshift shanties and shacks, with towels, sheets of plastic and plain sheets hanging down from the sticks and PVC pipes that were the frames. “Here is where most of the people are living,” Miriam said. Some of the people were sitting in white plastic chairs, the type of cheap patio furniture a bachelor would have in his home. But for these people, that was the extent of their homes. There were mothers holding babies, small children peering out through the corners of the shacks, and some people just stretched out on the ground, their bodies turned away from the road. The dirt path went on and on. “What happened to them, Miriam?” Steve asked. I didn’t want to hear the answer, since we all already knew what it was, but she said it anyway. We continued to pass people sleeping in shanties until, finally, Miriam stopped in the middle of the road. My eyes followed Miriam’s motion to my right as she said, “That’s the main building of the orphanage.” At first, I could not even see the orphanage because there was a forest on my immediate right. The road stopped and abutted a short concrete wall, maybe only 2 feet high. There was a lot, perhaps 30 feet by 200 feet, which had short trees and shrubs in it. There was no lighting and no sounds except the running of the jeep’s engine. “You can see the top part there, where the roof collapsed in the earthquake,” Miriam said. My eyes adjusted, and I could finally see the building. It reminded me of the old Firestone factory that had been abandoned in Los Angeles—a few stories tall, but very, very long and with many broken windows. It was dark inside, and I saw no movement around it. I looked at all the trees between here and there, all of the dark places for someone—or something—to hide. Instinctively, my hand gripped tighter on my knife, and my heart kept going a little bit faster. The cool breeze that had been coming off the mountain suddenly stopped, and the air in the jeep was a little bit hotter. I became aware of the beads of sweat running down my back, and the taste of the dirt and grit in my teeth. Everyone else in the jeep started laughing, and I realized, very thankfully, that they were just messing with me. “Did we get you? Did we get you?” Dr. Schroering asked. “Well,” I said, “as soon as we get in, I’d like to change my shorts if you don’t mind.” Everyone laughed as the jeep pulled forward, passing more shanties with people trying to sleep around them. When we reached the end of the street, we turned left, and off in the distance I could see a great gate ahead of us. When we finally pulled up to the 20 foot tall metal gate, I heard some rustling behind it. Someone from the guard tower climbed down and started to open it. It was as though we were medieval knights coming home to the castle and the portcullis and drawbridge were being opened for us. The jeep slowly rolled in and the three men, shotguns slung over their backs, nodded to the jeep as we entered the orphanage.